Come January 2019 and the world’s largest religious gathering, the Ardh Kumbh Mela will take place in Uttar Pradesh’s Prayagraj, formerly known as Allahabad. 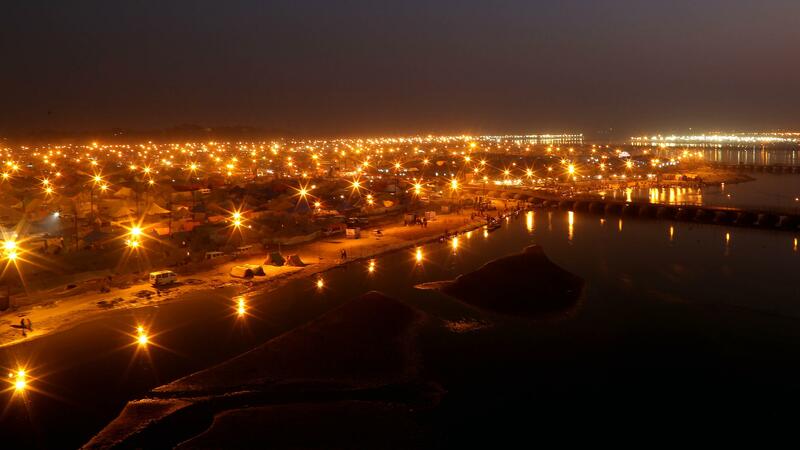 The Prayagraj Ardh Kumbh Mela 2019, which will commence from January 15 and go on till March 4, will be held at the Triveni Sangam, the meeting points of three rivers – the Ganga, the Yamuna and the mythical Sarasvati. For many of us, our knowledge of the Kumbh Mela comes from popular fiction – a large religious fair attended by scores of people where families usually get separated sometimes for a lifetime. But very few of us know the significance of the Kumbh Mela. This is why we put together the top 5 reasons why you should know about the Ardh Kumbh Mela and what better way to know it than experience it first hand and soak it all in. The Kumbh Mela’s origin can be traced back to Hindu mythology. According to legend, during the churning of the sea when the Amrit, (elixir of immortality) came up, a fight broke out between the gods and demons. To keep this elixir away from demons, Lord Vishnu transformed into his female avatar, Mohini and carried it away to a secure location. Mohini accidentally spilled four drops of the Amrit along the way. These four locations – Haridwar, Ujjain, Prayagraj and Nashik – are now the venues of the Kumbh Mela where people gather in large numbers to wash away their sins and attain salvation. The Kumbh Mela is held in each location on rotation every four years and therefore, each venue witnesses the Kumbh Mela once in 12 years. The Ardh Kumbh which takes place once in six years is held only in Prayagraj and Haridwar. The Kumbh Mela is the largest congregation of Hindus in the world with the Prayagraj Ardh Kumbh Mela 2019 expected to see a footfall of around 150 million sadhus, devotees and general tourists. Despite such a high influx of people, the whole event is planned and managed in a way that can give big event management companies a run for their money. With so many people gathering in one place, the vibe of Prayagraj undergoes a sea change and you can feel the spirituality in the air of the city. The zeal with which the Kumbh Mela is celebrated has also been recognised by UNESCO which has certified the gathering as an Intangible Cultural heritage. It’s definitely an experience worth undertaking. These sadhus (holy men) paint a vivid picture at the mela. The Naga sadhus are often seen with coils of matted hair and naked bodies smeared with holy ash. They usually carry a trident that are crowned with human skulls. While they look fierce, these sadhus are the most non-violent group of people, who have renounced all materialistic goods and become one with nature living a life of oblivion and avoiding human contact. Given this, they do not appear in public with the exception of the Kumbh Mela. It is interesting to capture these holy men at the mela as they too partake in the rituals to devoid their soul of sin. In the olden days, it is said that the sadhus would resort to killing in order to protect their religion. In order to cleanse themselves of this sin, they would take a holy dip in the waters of the river. At Prayagraj the Triveni Sangam is the spot where one can take a bath in the river to rid themselves of their wrongdoings. To this day, the holy men follow this ritual and are allowed to take a dip in the river before the common people. This ritual is called the Shahi Snaan or Rajyogi Snaan. It is one of the most important rituals of the mela often beginning as early as 4 am. It begins with a procession of all the holy men heading towards the river chanting and praying, while devotees line the roads to cheer them on by showering them with flowers. 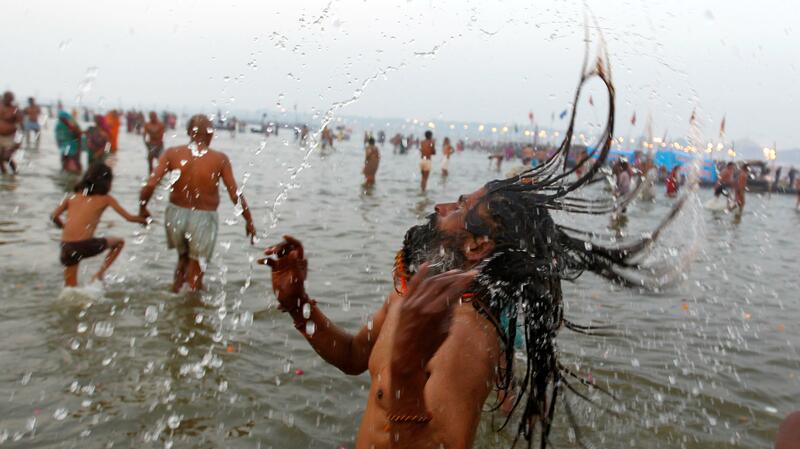 The snaan is the most photographed visual from the Kumbh Mela. The city of Prayagraj is beautiful and has a deep-rooted history. While attending the Ardh Kumbh, there are several sites of historic importance that you can visit in this city including Allahabad fort, Anand Bhavan which is the ancestral home of India’s first Prime Minister, Pandit Jawaharlal Nehru and Khusro Bagh, the tomb of Prince Khusro who was one of the sons of Emperor Jahangir. In the evenings, the city lights up and the glittering views from Triveni Ghat are a sight to behold. You can continue exploring the city late into the night during the Mela as the city is awake and buzzing with energy during these two months. These and many more diverse experiences await you at the Ardh Kumbh; so, book your tickets to Prayagraj right away. You can also check out some great stay packages brought to you exclusively by Eventraveler. If you’re looking to try varied experiences this New Year, the Prayagraj Ardh Kumbh Mela is definitely a great start. This entry was posted in Eventraveler Experiences and tagged Allahabad Ardh Kumbha Mela, Allahbad, Kumbh Mela, Kumbh Mela 2019, Prayagraj, Prayagraj Ardh Kumbh Mela, Prayagraj Ardh Kumbh Mela 2019, Triveni Sangam.